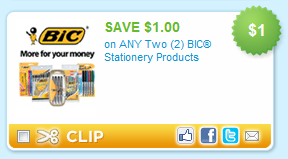 Print this $1/2 Bic Stationary Pens Coupon now while you can! Back to School deals are popping up in most stores, and rumor has it you will be able to score these pens for FREE at Target next week with this coupon. If you have issues printing this coupon, try selecting 2 other coupons and the 3 should print.